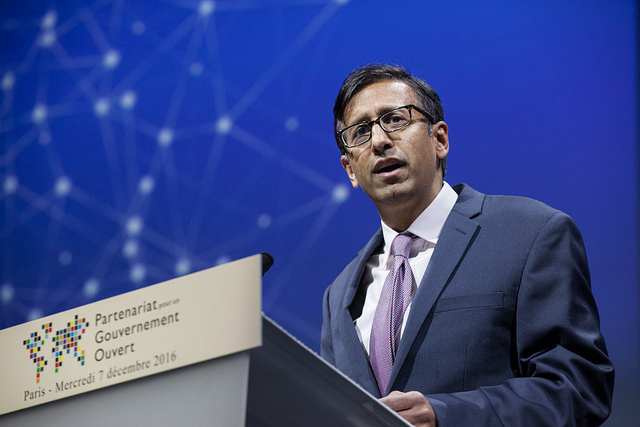 Manish Bapna, who co-chairs the Steering Committee of the Open Government Partnership, delivered these remarks December 7, 2016, at the Open Government Partnership Global Summit in Paris to set out the challenges facing world leaders and civil society advocates and the role open government must play in solving them. It is a great honor and pleasure to welcome you to the OGP Global Summit in Paris. I'd particularly like to recognize President Hollande and his team, whose leadership and commitment to open government have been invaluable. I would also like to thank my civil society colleagues, especially those on the frontlines, working in the most challenging circumstances to protect and advance open government. To the many heads of state, ministers, mayors, civil society colleagues gathered in this great hall, this is an important moment to reflect on the remarkable challenges of the past year. We have seen the rise of various forms of populism and nationalism in the United States, Britain, the Philippines, Italy, and many other countries. This has led to surprise election results and an increase in anti-immigrant and anti-government movements. We have seen the tragic results of conflict-driven migration, as captured in the iconic image of a three-year-old boy whose body washed up on the Turkish shore. We have seen governments struggle to respond to the refugee crisis. Some open their arms while others close their doors. We have seen deadly terrorist attacks in cities around the world - including this one -- that have forced governments to walk a fine line between the need to protect their people and the risk of infringing on their civil liberties. And we continue to confront two inter-linked challenges: the moral challenge of 700 million people in extreme poverty, living on less than $2 a day, and the existential challenge of a changing climate. All of these point to a failure of governance and, if we are honest, to a lack of open government that truly connects, engages and meets the needs of all people. The crux of the matter is this: While open government alone can't fix the world's problems, they can't be solved without it. Too many people feel excluded and marginalized. They believe that only elites reap the benefits of growth and globalization. They feel left out of decision-making. They distrust public institutions. How we collectively confront these challenges will be OGP's most important test. The leaders in this room -- and the wider community -- represent an inspiring counter-point to these worrying trends. We are on the frontlines of governance reform. We have the power to make change happen in our communities, cities and countries. We need to use this power to help create more open, inclusive and responsive governments and societies. Here are five essential steps we can take - we, the people here today - to help accelerate the shift toward open government. The first step: We must protect civic space - the rights to free speech, assembly and association - because these bedrock rights are at the heart of a functioning society. Serious violations of these rights have been recently reported by CIVICUS in over 100 countries. In 25 active OGP countries, these rights are repressed or obstructed. We have committed to uphold these rights, but we still have work to do. •	We need to show that the benefits of civic space are critical to making governments function effectively. •	We act when countries in the Partnership violate the basic rights they promised to protect, as we did with Azerbaijan and Turkey this year. •	As civil society leaders, we also have to hold ourselves to account. We must always keep in mind the needs of the people we represent. Most important, we need you, the heads of state and government in OGP, to stand with us to protect civic freedoms as enshrined in the Open Government Declaration. The second step: We must foster citizen-centered governance. We cherish OGP as a unique platform where government and civil society are equal partners in a way that amplifies the concerns of ordinary citizens. We commend the many OGP countries that have made significant strides. But we recognize that for others, this remains a major struggle. As heads of state and ministers, we need you to embrace the concept of co-creation. This means ensuring a fully functioning forum for dialogue between civil society and government is operating in all OGP countries. But we need to move beyond co-creation towards citizen-centered governance as the real promise of our Partnership. To keep this promise, citizens need to have a full voice in policy making. Only by listening to these voices can leaders learn what is most important in their citizens' daily lives. The third step: We must make changes that are transformational, not incremental. Drawing on our commitment to open government and the urgency of this moment, we must be willing to go further, faster. The good news is that more than 100 OGP commitments from around the world have been transformative in impact and fully implemented. But that accounts for only 5 percent of OGP commitments made to date. The Paris Declaration on Open Government aims to galvanize ambitious action on issues such as open public procurement, budget transparency, and climate action. We call on each country and civil society organization in the Partnership to sign up to a collective action on at least one issue. We also call on heads of state and government, ministers and civil society leaders to lead in the areas you care about most. We need you to work with others in the Partnership on these bold commitments. That's how we can build the movement to transform government. Transforming government brings us to the fourth step. We need to make a real difference in people's lives. This is our Partnership's ultimate aim. Because when open government works, it improves every facet of people's lives. •	This means giving all people safe drinking water and clean air. •	It means reliable electricity so children can have light to do homework and play. •	And it means building trust in public officials who are untainted by corruption. I urge heads of state and government, ministers and civil society leaders to make open government central to addressing the issues people care about, from providing basic services to fighting corruption to using natural resources wisely. This requires governments who will work across relevant ministries such as finance, health, infrastructure, and the environment. To show this is a priority, heads of state can convene cabinet meetings on open government. They can also allocate funds for OGP commitments. This also requires us to engage with leaders in cities and communities where governments are closest to their citizens. To mayors and other local officials here today, we look to you for inspiration, innovation and leadership. We are excited that 15 OGP subnational action plans will be announced this Friday at Paris City Hall. The fifth and final step: We need to reinvigorate the Partnership's political leadership. OGP's extraordinary achievement of reaching 70 countries with more joining today and 15 subnational members in just five years did not happen by accident. It was driven by political leadership at the very highest levels, from President Obama as the co-founder to President Hollande as the current chair. But as current leaders step down, we call on a new coalition of leaders from all levels of government and civil society to take Open Government to the next level. Taking it to the next level means focusing not only on broadening the number of countries or commitments, but more importantly, on deepening impact within countries to create lasting change. Given the dramatic unfolding of recent global events, we need to know who in this room will take the torch of open government forward. In closing, I would like to come back to what is happening in the world today. The rise of populist nationalism. The closing of civic space. Patterns of growth that still create too many losers. Together these trends threaten the values underpinning this Partnership. They challenge the essence of what this Partnership stands for. While open government alone can't fix all of these problems, these problems cannot be solved without open government. That is the challenge before us. This is the moment to act. And we must do it together.